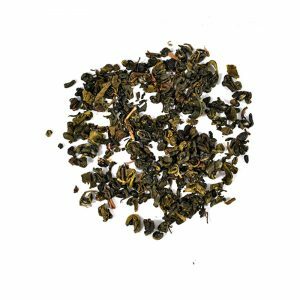 Ali Shan is an alpine green oolong tea from Taiwan. While relatively new, Ali Shan is one of Taiwan’s most famous tea growing areas, producing beautiful high mountain oolong teas from its misty peaks. Formosa, meaning ‘beautiful island’, is what Dutch traders called Taiwan. The teas grown here, mainly north of Taipei, continue to be called as such. Tea can be harvested up to six times a year here, although the high mountain teas may be only twice a year. Oolong tea had been a very important export for the island until the 1980’s, when tea growers turned their focus to native oolong enthusiasts. Today, oolong tea is mainly produced for tea lovers in Taiwan, and the rarest, most prized lots are extremely difficult to find in the West. Tea culture is so alive and well in Taiwan, annual competitions are held amongst tea growing districts to reward the most outstanding oolongs each year. Gold medal winning oolongs are some of the most expensive in the world.